The sun rises early in Denver, peeking over the flat horizon of the plains to the east and lighting up the mountains as it reflects off the face of the Rockies to the west. A destination in its own right, this time Denver was our port of call, the city from which we would catch an early California-bound train and begin our real journey. Two of my girlfriends and I were on our way to a week in Northern California, where we would live out of a van, exploring vineyards and lakes and granite monoliths, sleeping under the stars and going wherever we pleased. It only seemed fitting to take the long way there, to “feel the country” as John Steinbeck said, to discover exactly what lied between home and our destination. I guess, like Simon & Garfunkel, we had gone to look for America. It certainly was the long way. 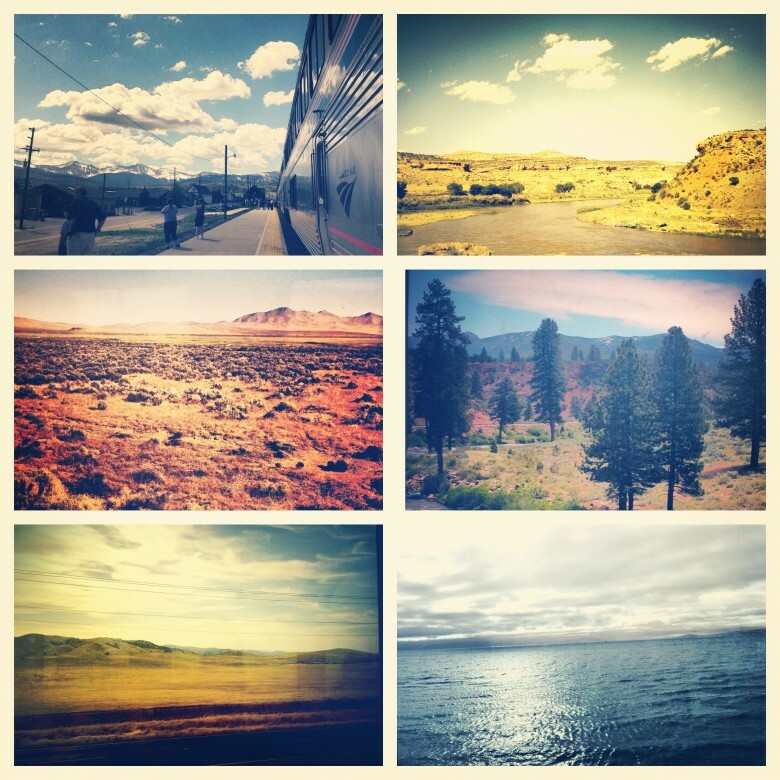 After flying into Denver from Nashville, our trip on the California Zephyr would be a 35-hour journey across four states, one that wouldn’t end until we reached the end of the country, where bay met sea and we ran out of land. With sleepy eyes and wet hair, we found our station, boarded the train and slid into a table in the lounge car, the community center of sorts, where snacks were served, guides narrated the journey and people gathered to play cards, read and pass the time. We nursed much-needed cups of coffee and waited for the whistle to blow, caught up in the haziness of morning and the nostalgia of the lost art of train traveling. “Is this your first trip on the Zephyr?” a middle-aged gentleman asked from the table across the aisle. At our response of “yes”, he was over in our booth, introducing himself, asking us questions and filling us in on the trip ahead. “Don’t tell me your names!” he said with a sparkle in his eye. “You need train names.” And he sized us up and gave us very romantic French-sounding names and we quickly realized that this train was more than just a form of transportation. It was a community of people, of adventurers who sacrificed efficiency and comfort for experience, and it was a place where you could be anyone you wanted. David was everything you hoped to meet in a fellow traveler. He was part rugged, living in a cabin high in the Colorado hills, and part bohemian, scraping up a living from painting, hopping on the train when he wanted to see somewhere new. His voice carried the enthusiasm of a child, his grey hair carried years of experience. He asked what we did and we rattled off boring answers about corporate jobs and bigger dreams, eagerly inquiring about his romanticized life as a wandering artist – a story that was filled with risk and loss but also practical wisdom. And in this world where we could be anything we wanted to be, I almost believed him. The California Zephyr is a historic railroad line that starts in Chicago and ends in San Francisco, connecting east and west and traversing plains, mountains, deserts and farmland along the way. Debuting in 1949, the Zephyr was originally operated by three different railroads – Chicago, Burlington & Quincy, Denver & Rio Grande Western, and Western Pacific – to cover the 2,438 miles between Chicago and the Pacific Ocean. Named for the ancient Greek word for “a west wind”, the Zephyr quickly became “the most talked about train in America,” known not just for its ability to get it passengers from point A to point B, but for a unique sightseeing experience, with schedules designed to pass through the best scenery in the daylight and friendly service from the “Zephyrettes”. Though some of the luxury was lost as train travel declined, Amtrak’s revival of the historical line in the 1980s gave modern travelers the chance to experience the same route through some of America’s most well-known passages such as The Continental Divide and Donner Pass. The Zephyr begins its route out of Denver by climbing up into the Rockies, the track narrowly nestled between a mountainous face on one side and a river on the other. It more or less follows the I-70 route across Colorado, making brief stops in towns such as Winter Park and Glenwood Springs, but it goes places an interstate could never go, taking tight passages, hidden routes and making you feel one with nature despite the modern technology propelling you along. The train has a few basic cars: the lounge car, the dining car that serves dinner with a view, and the viewing car, with floor to ceiling windows and rotating chairs where business men nonchalantly read newspapers as if they had never left their kitchen table and where you can sit and watch the country go by like the most beautiful motion picture you’ve ever seen. While a ticket in a coach was cheap, we’d splurged for a tiny roomette in the sleeper car, cramming three of us into a space barely meant for two. The small room featured two facing reclining seats that could be converted into a bed and an upper berth that folded down to make a second cot. Though sleep was hard to come by, it was worth every penny for access to the sleeper car, which gave us a place to leave our luggage, access to showers, and privacy – an area to retreat from the busyness of the rest of the passengers and be still and think. We quickly bonded with the car attendant, Johnny, a Chicago native who had been riding this route for 25 years – and still loved every minute of it. As the view out the window changed from snow capped peaks to the canyons of western Colorado and southeastern Utah, David’s words stuck with me. This trip had been symbolic for me, in a way. I have a bit of a gypsy soul trapped in a responsible, college-educated, holds-down-a-job and pays-rent-on-time body. Whether it was fair or not, I was pouring all of my wanderlusty, vagabondy dreams into this week on the road, and it was awakening restlessness and discontent in me. It wasn’t just that I loved to travel. It was that being out on the road, meeting new people, discovering and exploring made me feel connected and alive. It made me feel like me, and the disconnect between that feeling and my day-to-day life was hard to reconcile. In typical millennial fashion, I had dreams of writing and entrepreneurship and freedom and it felt like my responsibilities were keeping me from my passions. Maybe if I was more beautiful or more talented, or if I had a trust fund or maybe even just more dumb luck, I could be one of those people you read about who live extraordinary lives, but instead I was stuck being…well, typical. But this idea that there was art in all of us, that it’s not something you possess or don’t, but something you find and cultivate, resonated with me and motivated me. Maybe all the free people I envied were just normal people who found a way to create and dream and live within the confines we all face. And maybe, like the train, we each had a moment where we got on and we got off, and we had to embrace the journey that was uniquely our own. A stop at a station interrupted the rhythm of the train along with my thoughts, and I noticed David standing with a bag in his hand, handing me a luggage tag with his email address scrawled across it. “Find your art, Yvette!” he said, and he went off on the next leg of his journey, one that he’d traveled many times before but somehow, like the life he encouraged us to live, brought something new with every twist and turn. The most amazing thing about the Zephyr is getting to watch the country change and connect. Seeing landscapes you’ve read about not in a vacuum but in context as they bleed into each other and transition seamlessly, while at the same time creating the most incredible diversity. After watching the sun set over Salt Lake City and waking up somewhere in the middle of Nevada – a true desert, brown and barren – we geared up for day two, the final 12 hours between us and the City by the Bay. The second half of the trip is the most diverse, beginning in the desert and climbing suddenly into the Sierra Nevadas. Then there’s Reno with its neon casinos and the Central Valley with acres of lettuce and almonds and pomegranates and mountains rising the distance, and Sacramento, with big box stores and traffic lights. When the water began, we knew were close. With Otis Redding’s ‘Dock of the Bay’ in the earphones, we watched the end of the line disappear into the San Francisco fog, and we knew our journey was just beginning. It had only been 35 hours since we’d boarded the train, but we had learned how to play gin rummy from a 10-year-old, talked about the blues with Johnny, and exchanged travel stories with David and business tips with old men. We’d eaten breakfast in the Rockies, dinner in the desert and lunch in the Sierra Nevadas. And most importantly, we’d gained perspective – that this life we were living was extraordinary. From the unforgettable trip we’d just been on to our mundane daily commutes, every experience was shaping who we were, and in each of them, we got to choose to create something special, to find our art, to build the life we wanted to live. We’d gone to search for America, but maybe in a way, we’d found ourselves. Go: The California Zephyr runs daily from Chicago to San Francisco – though you can get on or off at any of the stations it runs through. The Denver to San Francisco section gives the best scenery without the time commitment of starting in Chicago (a 52 hour trip), and the Denver train leaves around 8 a.m. and puts you in San Francisco around 5 p.m. the next day. Rates for a one-way ticket range between $137 and upwards of $1,000, with accommodations from a single seat in a coach to a full bedroom suite with its own bathroom and shower available (sleeping rooms do include all meals and should be booked well in advance). 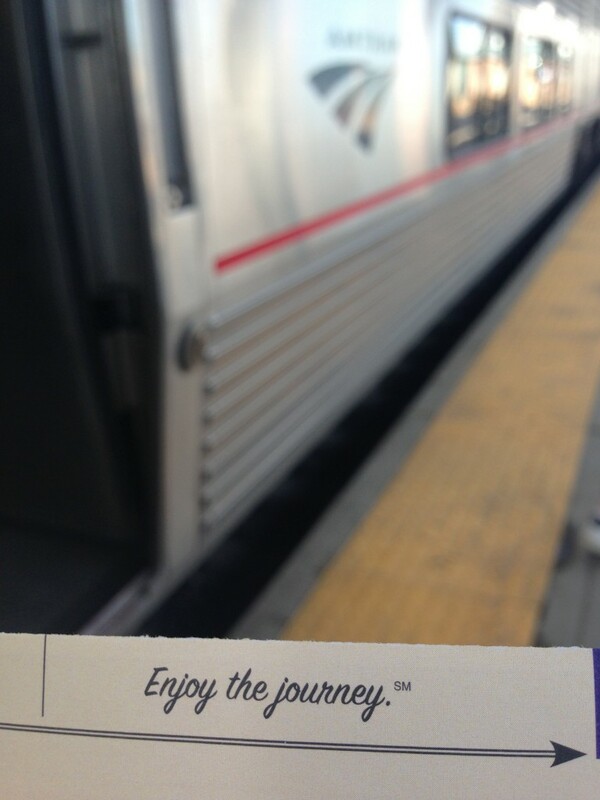 Tickets and route information can be found here: http://www.amtrak.com/california-zephyr-train. Note: The San Francisco station is called “Emeryville”. At Emeryville, a bus will take you across the Bay Bridge into the heart of San Francisco, as part of your fare.